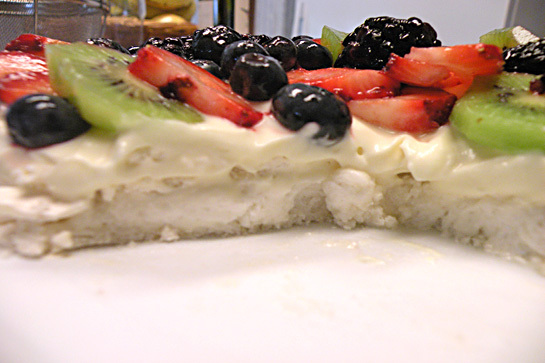 I have been wanting to recreate this fabulous dessert for years now. It just might be the best thing I have ever sought to make or have ever eaten for that matter. 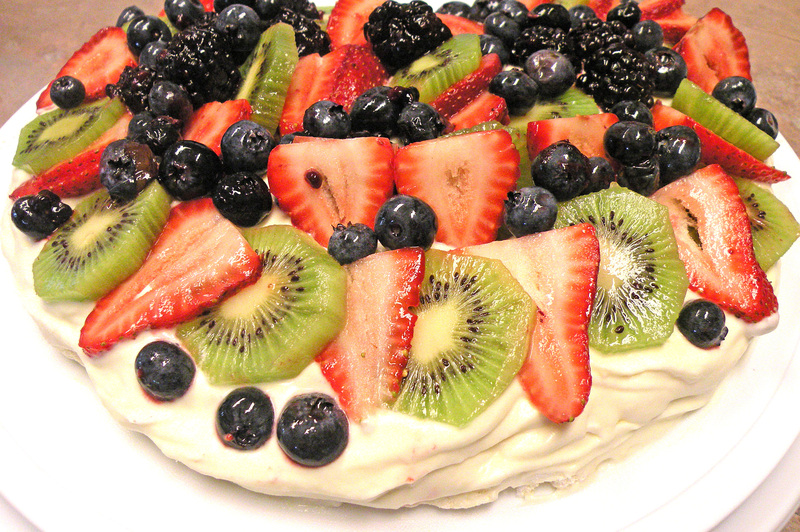 It has a crunchy meringue shell on the bottom, then a sweet, creamy whipped cream layer that is dotted with lemon curd and then topped with tons of fresh fruit. It is decadent but light and refreshing all at the same time. The perfect dessert for this summer heat! I want to thank my friend over at Grazing In The City for sharing this wonderful recipe. Here it is for the rest of you. Enjoy!!! Preheat oven to 250F and arrange a rack in middle. Line a baking sheet with parchment paper or a silicon mat. If using parchment you can trace a circle with a 9″ cake pan if you like. Place the egg whites and salt in clean, dry bowl. Mix on medium speed until the whites lighten in color and become thick and foamy with small bubbles, about 2 minutes. Increase speed to high and slowly add 1 cup sugar in a thin stream. Mix until firm, shiny peaks form, resembling marshmallow cream, 3-5 minutes. Sift cornstarch into the meringue. Lightly fold the vinegar and vanilla into the meringue with a rubber spatula until no streaks of vanilla remain. You want to get everything combined without deflating the egg whites. They should remain as light and fluffy as possible. Using the rubber spatula, pile the meringue into the center of the circle or the center of your lined baking sheet and smooth it to form a rough, even disk about 1-inch tall. Bake until the meringue is firm but slightly soft in the middle, about 60 minutes. Remove from oven and cool completely. Run a thin metal spatula under the meringue to loosen. There will be some cracking, this is normal. Carefully slide it onto a serving platter. Place cream, sugar and vanilla in a clean bowl and beat on MED-high speed until soft peaks form, about 1 1/2 to 2 minutes. You want to make a good, stiff whipped cream. Using a rubber spatula, fold the chilled lemon curd into the whipped cream. Don’t completely combine. You want to leave big streaks of lemon curd throughout the whipped cream. Pile the mixture into the center of baked meringue and spread to the edges. 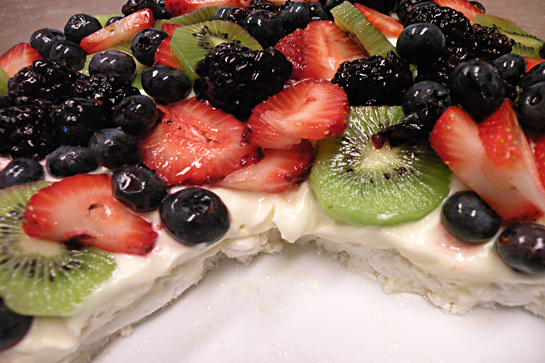 Top with the fresh fruit to make a great presentation and serve immediately. Enjoy friends! Thank you so much, Donna! You pretty much summed this dessert up perfectly – it really is decadent but light and refreshing at the same time! Love all the different fruits you used as well. Cheers! Thank you for sharing it! It was SOOo good and fun to make also!! What a beautiful recipe! I’m a pinner now over at Yum Goggle – if you are not registered, please consider doing it and submitting this so I can pin it to the YG community board – it is beautiful!! Thank you Kelli, I will be sure and check it out! I have not heard of it but sounds interesting! Thanks again! I’ve been wanting to make this, too–it’s such a pretty dessert! Thank you Nancy! Just jump in and do it, you won’t be sorry! !